We're happy to announce that FADER will have a stage at UR1, the new two-day music and art festival from the co-founder of Ultra that's taking place in Miami's Bayfront Park on December 8th and 9th, during this year's Art Basel. Happening on December 9th, the FADER stage lineup includes Real Estate, Tanlines, Wild Nothing, Le1f and The Drums, plus more special guests to be announced soon. 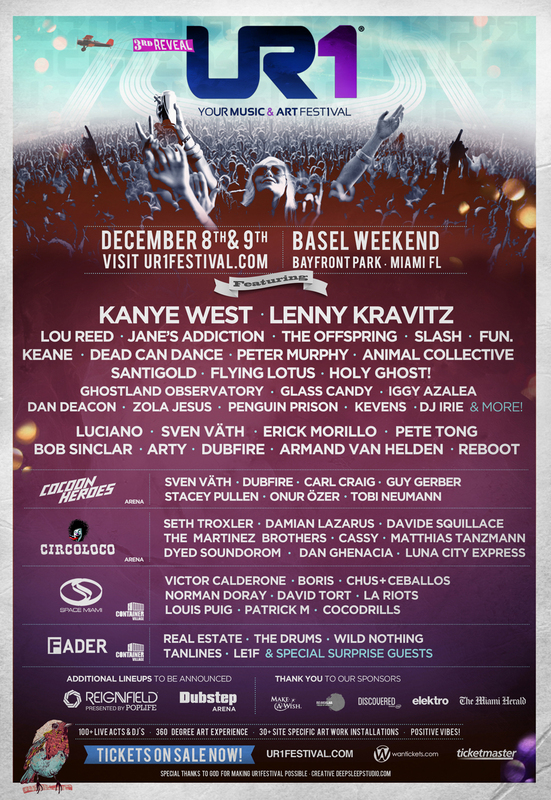 Kanye West and Lenny Kravitz will headline the festival's main stage, where Lou Reed, Santigold, Animal Collective, Flying Lotus and some 40 other artists will also perform. Buy UR1 tickets now or check back here in the next few weeks to win VIP passes.